Employees of Syngenta companies in Switzerland are automatically insured by Syngenta Pension Fund. Insurance in the Syngenta Pension Fund is mandatory all employees of Syngenta. Anyone who is over the age of 18 and whose annual base income exceeds the minimum salary stipulated in law (see regulations for exceptions). Employees on hourly rates, part-time employees and ancillary staff who meet the general conditions for admission are also explicitly insured. On admission to the Syngenta Pension Fund, possible vested benefits, i.e. portable sums from previous benefits schemes in Switzerland, will be credited to the retirement plan. When do I join the Pension Fund? You are admitted to the Pension Fund when you take up employment with the company, but not before the age of 18 (when contributions for risk insurance start). 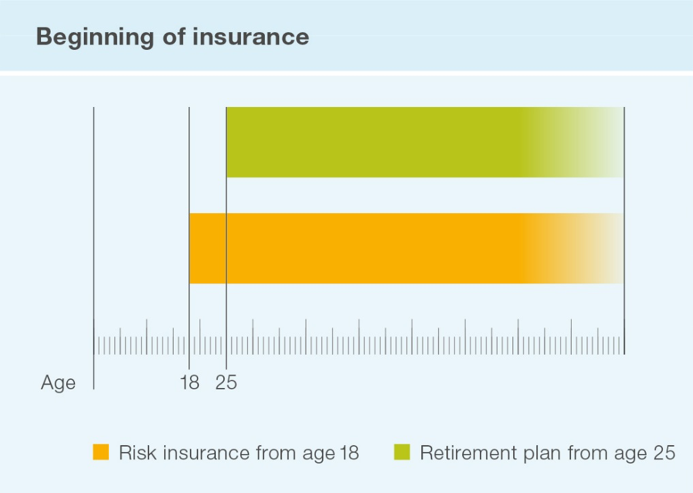 At the age of 25, the savings process begins for retirement assets on the retirement plan. How is the age calculated for admission? The age of an insured member results from the difference between the current calendar year and the year of birth.